Sorry i am new and just got a poly circulator. my first thing was steaks. but i have 2 people that like it medium rare and 2 people that like it well done. how can i do this the best way? also been playing with eggs but can't get them right. tried 148-151 seems like i get the yolks too cooked or whites not done enough. - You can cook the well done steaks first, then lower the temperature and put the medium rare steaks (leaving the other two steaks there, warming up or tenderizing. 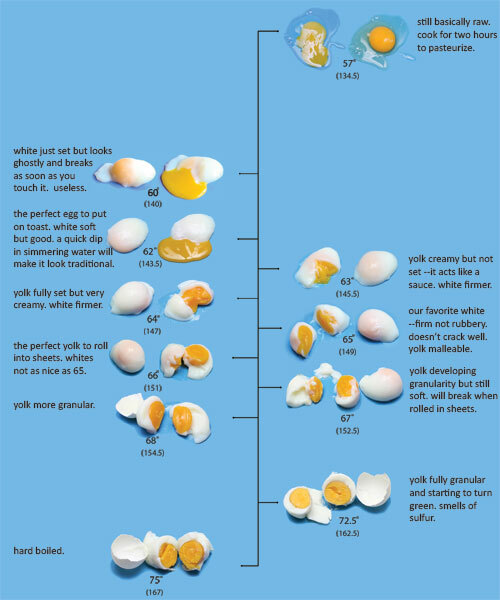 As for the eggs: the whites won't get cooked, their proteins don't cook until 167F, the best you can do if you want them a bit firmer is to cook to where you like the yolks (and even a bit lower temp) and then plunge the eggs for a minute in boiling water to firm 'em up. But do experiment, that's what fun about precise temperature cooking, it's so scientific you can reproduce your results easily and it gives you the flexibility to play. P.S. I was half-kidding about people who eat meat well-done. thanks for the reply. i agree with the well done people but its my mom and sister so i can't yell too much. i didn't even think about cooking the well done at 140 first then lowering to 132 and cooking the others and leaving the well done in. that would be the idea. i was going to cook the well done steaks the day before and quick chill and freeze then do the medium ones and quick chill and freeze. then heat up at 130 for 1 hour and sear and serve. but i think i like your way better. i will experiment with eggs though. i have been expermenting with creme brûlée in baldwins cookbook. Chris, will you post your result here? I too just received the polyscience IC and am curious about people's results. Thanks! @Elsie. It seems like 133 is good for medium rare. 140 wasn't done enough for my sister and mom. i have had good luck with skinless boneless chicken breast at 144 for about 1.5 hours. i put a little lemon juice in the bag and seems to be pretty good. let me know what you have come up with. also french fries come out great too. they work great when blanched at 170 for 15 minutes then double fried. even better when after first fry they are frozen for at least over night. first fry for about a minute. We did some strip loins last night. they were Kobe beef which we got at Costco. They were only an inch thick (we prefer them 11/2" thick) so I was a bit worried about them. However, I needn't have been concerned. I cooked them at 131.7 for 2 hours then gave them a quick sear in a blazing hot cast iron pan. they were perfectly medium rare. I did try an egg one day but the whites were not cooked while the yolk was overdone. Personally, I think that using an IC to cook eggs is overkill and I'll stick with the stove top method. I did do scallops and pork chops and both were wonderful. On the side topic of eggs, I just got a set of the eggies as seen on tv. I plan to separate the yolks and cook the whites in boiling water, then return the yolks and finish in the sous vide. I'm shut down right now as I am replacing the deep fryer I was using with a butterball turkey deep fryer. yes i am too having trouble with the eggs. don't need them just trying new things. i think i need to buy a cover for the plastic box i cook in. to much heat loss. has anyone tried the balls that poly sells? also my wife is concerned about cooking in plastic bags. probably not the healthiest thing to do. the best deep fryer i have used so far is the one by emiril. it has a box underneath that filters and stores the oil for you. very easy. Chris, I had been using a Presto Profryer but it tends to be shallow and requires dipping out the water to clean. My new turkey fryer much deeper giving more capacity. Also the turkey fryer has a drain valve which is much easier. geneK how did the eggies work? ElsieD, I haven't got the new system set up yet. I'm debating installing the pid controller and solid state relay inside the unit If I do mount it inside, I'll have to also install a bypass switch so it can still used as a deep fryer.